506 VAR SAN MARINO (1947) US stamps*. Flag*. Pair imperforate horizontally. Scott No 267, Yvert No 309. 5194 VAR SAN MARINO (1947) Roosevelt*. Flags*. 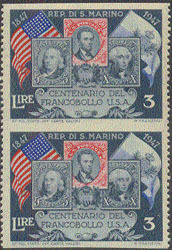 Perforation error in bottom pane of 20, with an extra row of perforations across the middle of the bottom strip of 10 stamps. Scott No C51c, Yvert No PA55.